Department of Art | Cute and Creepy Catalogue Reviewed! Home » Cute and Creepy Catalogue Reviewed! Cute and Creepy Catalogue Reviewed! 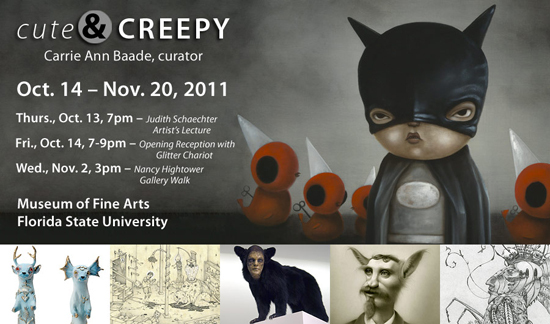 FSU Art Professor Carrie Ann Baade curated an exhibit last year: Cute and Creepy at the Florida State University Museum of Fine Art. The catalog was picked up by a publisher. Well, just this week it got an amazing review by the Arts Library of North America by Massachusetts College of Art and Design Librarian, Gabrielle Reed! Which means the book will have a life beyond the exhibit. We are so delighted! Cute & Creepy, by Carrie Ann Baade and Nancy Hightower. Museum of Fine Arts, Florida State University, dist. By University of Washington Press, October 2011. 68 p. col. Ill. ISBN 9781889282244 (pbk. ), $19.95. “Don’t let the title put you off; this is an impressive and valuable catalog. It skillfully documents the exhibit Cute & Creepy at Florida State University Museum of Fine Arts from October 14 to November 20, 2011, curated by FSU painting Professor Carrie Ann Baade. This softback book is rich with detailed images. The high-gloss of the images really makes them pop in contrast to the flat tone text. Flipping through the pages, you can’t resist gawking, which is just right, since gawking is what the show and the catalog are all about. Thoughtful attention has clearly resulted in an effectively designed book. Nancy Hightower’s companion essay “Revelatory Monsters: Deconstructive Hybrids, the Grotesque and Pop Surrealism” is an examination of humanity’s obsession with that which terrifies/pleasures “the monster” and that which repels/intrigues “the grotesques” and how this duality is at the very core of humanity. Ms. Hightower’s essay is also a guiding narrative to select exhibition pieces and takes the reader on a tour of the many aspects of pop surrealism and what it has become today. Her lush descriptions and scholarly references bring validity to an art style that in the past been criticized as being kitschy and or lowbrow. The following pages feature the artists in alphabetical order by last name. Each artist’s page features images, an artist statement, and artist contact information with exhibition history included. The technical skill of many of the images represented in this catalog can only be described as something from the Northern Renaissance, reminiscent of the detail quality Hieronymus Bosch executed in his panels “Garden of Earthly Delights.” Cute and Creepy is a lovingly devoted grandchild of Bosch’s triptych. See this PDF for the full glowing review!